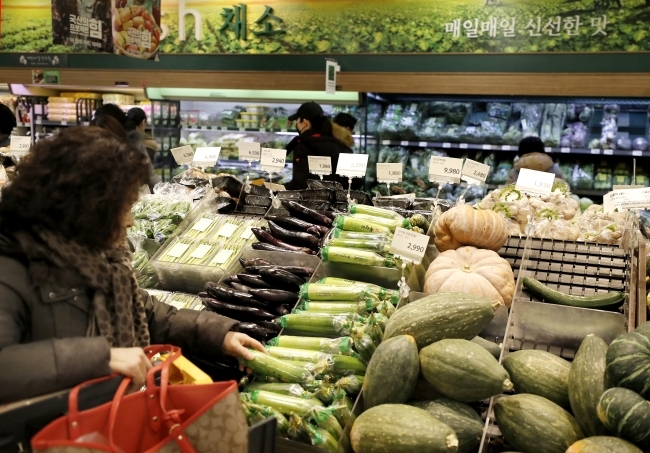 South Korea’s monthly consumer inflation came to 1 percent in January on-year, the slowest gain in 17 months, as the prices of agricultural goods such as vegetables fell, data showed Thursday. Calling such weak inflation “economic stability at target range,” the government pledged Thursday to carry out pre-emptive measures to curb consumer price fluctuations ahead of next week’s 2018 PyeongChang Olympic Winter Games and the national Lunar New Year holiday later in the month. “There is a need for pre-emptive measures to address concerns about inflation ahead of the national holiday, the Olympics and the minimum wage hike,” Ko Hyoung-kwon, first vice minister of the Ministry of Strategy and Finance, said in a meeting at Government Complex Seoul on Thursday. The Lunar New Year holiday falls on Feb. 15-17, while the Winter Games are poised to be held from Feb. 9-25. Ko added the 1 percent monthly inflation in January indicates the national economy is “in a stable condition,” below the upper bar of the 2 percent goal. The nation’s composite consumer price index in January came to 103.46, up 1 percent from 102.43 a year prior, according to data from Statistics Korea. This marked the slowest on-year rise of consumer prices since August 2016, when the price index edged up 0.5 percent. The reference base for the composite index is 2015, when it equals to 100. The inflation rate for food dipped 2.6 percent on-year, contributing to the sluggish inflation. The price of vegetables fell 13.1 percent, while fruits and seafood suffered price surges of 5.4 percent and 4.4 percent, respectively. By products, prices of eggs, tomatoes and carrots fell 31.8 percent, 32.5 percent and 48.2 percent on-year, respectively, while prices of radishes and cabbages dropped 45.3 percent and 27.8 percent, respectively. Statistics Korea cited the base effect as the reason for the decline in prices, meaning prices of the goods were extraordinarily high in January 2017. Prices of gasoline and liquefied petroleum gas surged 2.9 percent and 17.5 percent, respectively. The core inflation -- excluding items subject to price volatility, like food and energy -- rose 1.1 percent on-year. Meanwhile, the minimum wage increase starting January did not affect restaurant service prices, according to the government. The monthly inflation of restaurant service prices came to 2.8 percent on-year in January, up 0.6 percentage point compared to a year prior, according to Statistics Korea. “Considering the tendency of a price hike among restaurants early in the year, the minimum wage hike appears to have had a limited impact on inflation,” said Ko of the Finance Ministry.